President Medvedev appears confident behind the podium, but fails to confirm his candidacy for 2012. Russian President Dmitry Medvedev gave a major press conference on May 18, marking the opening of full-blown electioneering by the Kremlin. Pundits were watching closely, expecting that the president would announce his candidacy for the presidential election in March 2012. 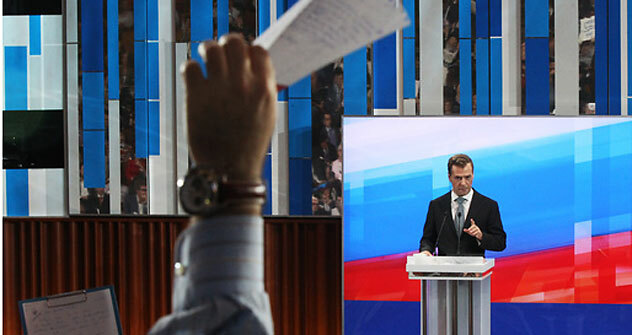 The election question was the fourth to come up, and Medvedev himself said he was expecting it to be first. But he moved quickly on to dodge the issue. Medvedev then began fielding questions from the more than 800 journalists in attendance and was forthright in his answers. Like Prime Minister Vladimir Putin's speeches to the Duma in April and to United Russia at the start of May, this press conference is part of the launch of what will be a sustained campaign by the Kremlin to rev up the people ahead of the elections for the Duma in December and the presidency in March 2012. Both men are using these appearances to clearly define their different but complimentary personas – Medvedev the “modernist” and Putin the “traditionalist” – that will appeal to an increasingly divided voting population of haves and have-nots. This media campaign is motivated by the fact that the Kremlin is facing a silent political crisis. United Russia, the party of power, Russia has lost all credibility in the eyes of the man on the street and will struggle to win a simple majority in December’s vote. The two leaders need to revitalise the government’s appeal to the population and so are highlighting all the progress that has been made in the last 10 years. The main message from Medvedev’s press conference seems to be that as the president mounts his own media campaign—in which he appears comfortable, confident and in command of his facts—the chances that both men will stay in their respective jobs following the upcoming election cycle is increasingly likely.